The last post on the arithmetic subtleties of the Tetractys got me to thinking. If I have four rows of things I can select or not select for a collection, I end up with so many results. The overall number of distinct results, of course, is 10 (Monad through the Decad), but I thought a bit deeper about it. I mean, I disregarded multiple ways of adding up to a given number before, and what if I took all those into account? After I did the math, I realized there are 16 ways to add different selections of the ranks of the Tetractys together to get a certain sum. Four rows, 16 results. Sound familiar? Yup. I accidentally found a way to link the Tetractys to the 16 figures of geomancy. Before reading, I suggest you brush up on the terms of geomantic operation, specifically for what inversion and reversion is. Besides, it’s been a while since I mentioned anything substantial about geomancy, so this is an interesting confluence of studies for me. This isn’t that much a stretch. Yes, the elements properly belong to the Tetrad as a whole, but we also can think of the four elements as numbers in their own right. We know that Fire is the most subtle and Earth the least, and that Fire is the least dense and Earth the most. Similarly, the Monad is the most subtle and least concrete number, while the Tetrad is the most concrete and least subtle. We can assign the four elements accordingly to the four numbers of the Tetractys with agreeable ease. Going from top to bottom, we see that there are important patterns present in the chart. Figures for 0 and 10 (Populus and Via) are inverses of each other, as are 1/9 and 2/8. The manifesting 3 and manifested 7 figures are also inverses, as are manifested 3 and manifested 7, and so forth. Coniunctio and Carcer are both italicized, since they’re both equally manifesting and manifested and it’s hard to tell which is which, especially since they’re both equally added to by 5 and are in the middle of the list. We see that the greater the sum, the more “dense” and active the figure becomes, and we get more stable the further down we go (with one exception we’ll get to later). As might be expected from Iamblichus, the number 5 is the pivot and balance for all the other numbers, and accordingly the manifested and manifesting properties of this number are in agreeable and balanced growth. We can also note that the “extreme” (0, 10) and median figures (5) are what we’d also call “liminal”; figures that are the same when they’re reversed. We have this constant shifting balance throughout the structure of this Tetractyan geomancy that keeps popping up, so that’s cool. In this sense, the terms “manifesting” and “manifested” become a little clearer. Figures that are manifesting bring that quality into existence, while figures that are manifested represent that quality already in existence. It’s the difference between “becoming/causing” and “existing/evidencing”. Thus, Fortuna Minor is manifesting harmony, since it requires one to work with others, indicating that one’s own power is not enough to carry the day; other interaction is required. On the other hand, Albus is manifested harmony, maintaining equanimity and reflection unto itself, self-sufficient and uninvolved with anything else that might disturb it. Similar cases can be drawn up for the other sums, so it’s interesting to see how geomancy can reflect these numerological concepts in its own logic. What about the numbers for which there’s only one figure? The figures of 0, 1, and 2 are the inverses of the figures of 10, 9, and 8, respectively, and if we keep our mobile/manifesting and stable/manifested idea, then 0, 8, and 9 are manifested qualities while 1, 2, and 10 are manifesting. It seems odd that Populus should be among the mobile/manifesting figures and Via among the stable/manifested, but the swap here makes sense in a cyclical way; after all, with either absolutely nothing or absolutely everything present, we end up able to repeat the whole process, since if everything is all one Thing, one can no longer draw a difference since there’s nothing different (hooray, paradoxes). So, Individuation and Realization are manifesting and manifested qualities of a metaquality “Becoming”; Relation and Mixture of “Variation”; and…hm. We have Wholeness as the quality for 10, but what about 0? What’s probably most bizarre about this interpretation, at least in a strictly Pythagorean sense, is the “sum” of Populus being 0. Zero was not considered to be a true number by the ancient Greeks, or really by anyone in the Western world, up through the medieval age when Arabic and Indian mathematics started becoming popular to study. After all, they might ask, “how can nothing be something?” Besides, with the Tetractys itself, all things are based on the Monad. The Monad defines and begins all things on the Tetractys and existence itself, yet it itself cannot come from nothing, for it never came or became at all. We haven’t encountered the notion of “nothingness” before in our mathetic studies, so what might it represent? Honestly, I’d consider it to represent Emptiness in the Buddhist sense where all things are interconnected and rely upon each other. It’s not quite Relation or Harmony or any of the other things, but it would be closest to Wholeness; after all, Matter must exist within Space, and all of Matter exists within all other Matter, always influencing and influenced by itself. It’s weird, though, but think of it like this. In all things, Populus must exist as the template for all other things, the ideal form that even the Monad itself represents as itself. Without Populus, we’d have no geomantic figure, just as the Good itself cannot exist apart from Goodness. Even Wholeness must reside within the form of Emptiness, just like how Populus must be present (even if “hidden” or implied) in every geomantic chart. So, if Wholeness is the Decad, then Emptiness is the Mēden (Μηδεν), or “Nothing”. But both, in an obscure sense, are the same. These qualities, though paired up to indicate something like an opposition or dichotomy, doesn’t seem to indicate anything of the sort, but rather two interconnected concepts that cannot be separated from each other. After all, in order for one to become One, something whole and complete in and of itself, it must go through a process of becoming and enforming to become real (Individuation and Realization, 1/9). In order for different things to relate, oppose, agree, or move with each other, they must be put together and combined (Relation and Mixture, 2/8). In order for different things to agree, combine, and merge together, they must share certain qualities and be germane to each other (Harmony and Essence, 3/7). In order for things to possess form, body, and dimension, they must have a structure and consistency that allows them to maintain it (Form and Order, 4/6). In order for something to exist, it must exist because of something else, or it must allow for itself to be filled with creation (Emptiness and Wholeness, 0/10). Growth…well, growth expands in all ways, in all dimensions, and itself provides a balance that nurtures and metes out all other qualities (Growth and Growth, 5/5). So, we have five pairs of qualities of the numbers, and one single quality that forms its own pair. What might we call these metaqualities? These are terms I just pulled off the top of my head, so I don’t expect them to stay permanent terms, but they do tend to fit. Individuation and Realization are both qualities that are required for anything to become One Thing or one thing. Relation and Mixture are both required for anything to be different or have difference among others, to either vary or be a variation. Harmony and Essence are both required for anything to agree with or find similarities with in an accordance. Form and Order are both required for anything to have a body or to form a body in a coherent structure. Emptiness and Wholeness are both required for anything to exist, either on its own as a Whole or as part of a Whole filled by it. Growth can apply to any and all of these things, and mediate between any two qualities that form part of a metaquality pair. In a way, the metaqualities form their own Tetractys, with Becoming related to the Monad, Variation to the Dyad, Accordance to the Triad, and Structure to the Tetrad. Growth, as a balance, forms part of the “hidden” Pentad underlying the Tetractys, and the four metaqualities again form another “inverted Tetractys” under it. Thus, the “upper Tetractys” is composed of Individuation, Relation, Harmony, and Form; the “lower Tetractys” is composed of Realization, Mixture, Essence, and Order. 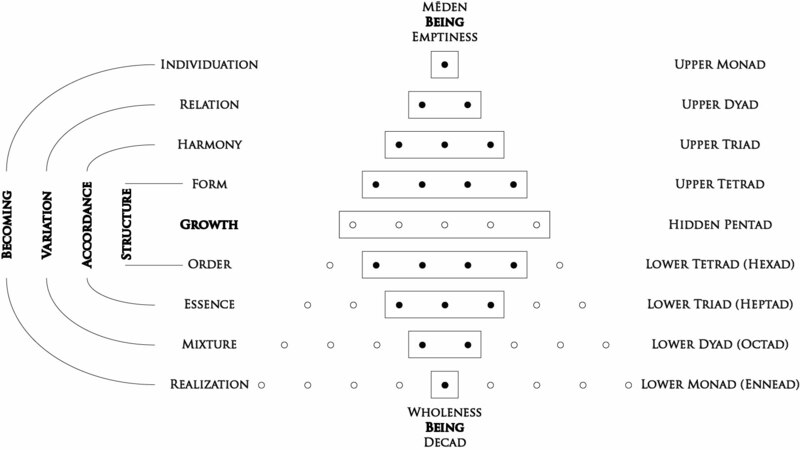 Growth mediates between the two as the “hidden Pentad”; Emptiness and Wholeness are at once present at all points throughout this dual Tetractys figure. While my Tetractys research is still new to me, geomancy is not, and being able to understand more of the Tetractys with symbols and terms I’m already familiar with is a huge help to me. Like I said, I don’t know whether this type of analysis has ever been attempted before, but it’s certainly something that I plan on continuing. Geomancy, after all, is a binary system based on the number four, and within four is 10 and thus all other numbers. Perhaps the two were meant to be wedded all along.